For almost a decade I’ve been building a model of how learning works to prompt performance. Each iteration gets better (in my unbiased opinion). 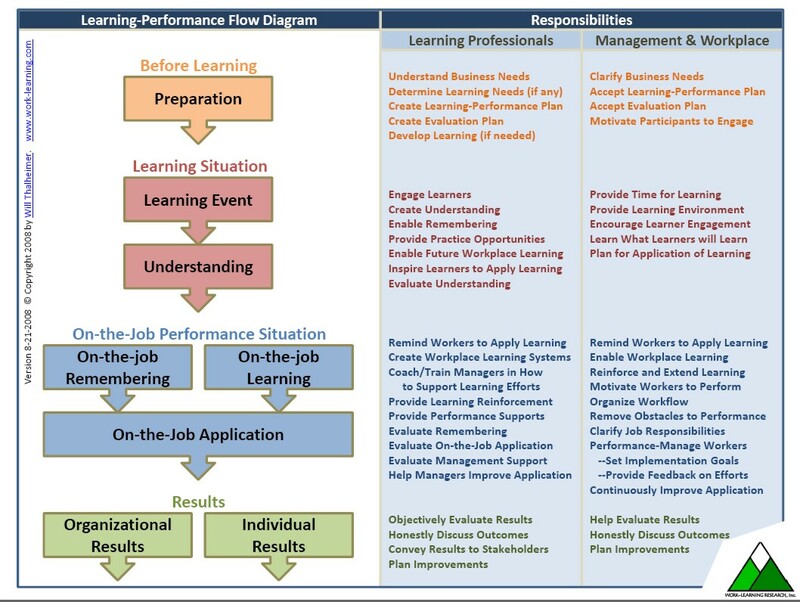 Here’s the latest one–this one has the advantage of pointing out the responsibilities learning professionals have AND the responsibilities that learners’ managers and the workplace have in creating on-the-job results. As a visual metaphor for how learning works to drive on-the-job performance and results. As a job aid to assign responsibilities and tasks. This graphic draws on many sources, many I’m probably unaware of. It draws from the wisdom of authors such as Wick, Pollock, Jefferson, and Flanagan of Six Disciplines of Breakthrough Learning fame, and Tim Mooney and Rob Brinkerhoff from the new book Courageous Training (which is great by the way, I’ll review it within the next month). It also draws from countless researchers on learning, memory, instruction, and cognition who have helped me understand learning at a deep level, enabling me to add to models that don’t fully include wisdom on how learning and cognition really work to drive remembering. Also, I’d like to thank my many clients who have enabled me a great real-world workshop in which to think deeply about how learning works in a practical reality. I’d particularly like to thank my friends at Walgreens, and especially Anne Laures who commented on an earlier version of this model. As always, this is a work in progress, so let me know what you like and what I might be missing. Note, of course, that human learning and performance is too complicated to include every factor of relevance. My goal is to create a model simple enough to be easily understood and precise enough to be useful and provide practical learning-to-performance improvement. Oh, if you have to give it a name, you might call it the Learning-to-Performance Landscape Model, but I’ll probably come up with a better name.